Ahh such a shame we only have a small reference to this fabulous photo. 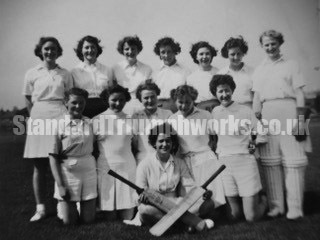 Dated c1950, we can’t make the photo much larger so show faces better, but we can offer a couple of clues. The photo is marked the Standard Ladies Cricket Team and it’s now over to you to see if you can help with any more information.